How Much Money Are You Giving to Israeli’s Military Machine? Since the beginning of the Great March of Return, beginning on March 30, 2018 and continuing to May 15, 2018, Nakba Day, tens of thousands of nonviolent demonstrators took to the Gaza/Israel border to claim their right, by international law, to return to their lands. Israeli sharp shooters have responded by targeting and killing more than one hundred men, women, children, infants, medical workers and press with live ammunition and injured thousands more, often resulting in life-long crippling injuries. On May 14, the day before Nakba Day, more than sixty nonviolent protesters were shot dead by Israeli military forces. The tragedy is unspeakable, but some Palestinians present put words to their pain, anger and a glimmer of hope. How Much Are You Giving Israel for Weapons? The Obama administration agreed to give Israel $38 billion dollars of weapons between 2019 and 2028, $3.8 billion dollars per year. Israel will use these weapons, in violation of US laws, to commit human rights abuses against Palestinians, including injuring and killing civilians, detaining and abusing children, demolishing homes, uprooting agriculture, and denying freedom of movement and expression. U.S. citizens are footing the bill for this carnage through their tax dollars at an average of $25.25 per taxpayer. To find out how much your state or your city is contributing to Israel’s weapons and how you can “offset” your contribution to occupation forces, click here. The first Christ at the Checkpoint Conference in the United States will be held in Oklahoma City, OK, October 15 – 18, 2018. Since 2010 Palestinian Christians have held an international Christ at the Checkpoint Conference at Bethlehem Bible College in Bethlehem, Palestine every other year. Organizers of the U.S. conference feel “compelled to address the injustices that have taken place in the ongoing conflict between Israel and Palestine, particularly the Palestine lands under occupation…We believe that standing up nonviolently to injustice is an acceptable expression of our faith.” For more on the conference and to register, click here. Reach out to your pastor, church council and congregation to encourage your church to sign the HP Free Church pledge, committing to not buy HP computers, printers, inks, and other products until HP stops profiting from occupation and human rights violations. For more on the HP-Free Church Campaign go here. Copyright © 2018 MennoPIN, All rights reserved. You are receiving this email because you asked to join the Mennonite Palestine Israel Network (MennoPIN). As the Great Return March enters its fifth week, 45 Palestinians have been killed while thousands more have been injured. The nonviolent demonstrations, at the border between Israel and Gaza, began on Land Day, March 30, 2018 with protests against Israel’s refusal to allow refugees the right of return to their lands guaranteed by international law. The march will end on May 15, 2018, Nakba Day. Known as the “day of catastrophe” among Palestinians, Nakba Day this year marks the time seventy years ago when Israel became a state and violently drove hundreds of thousands of Palestinians into exile and killed thousands more. The demonstrations are expected to spread throughout Palestine on Nakba Day.Most Western media coverage of the Great Return March concentrates its attention on the few who have thrown rocks or rolled burning tires. Hamas is often portrayed as instigators of the demonstrations. Nothing could be further from the truth. The protests are intentionally nonviolent, and organizers of the march come from all segments of Gaza’s civil and political society, of which Hamas is one part, but only one player. It is the Israeli military forces, sheltered safely hundreds of meters away, who commit the violence, using sniper fire, teargas and grenades.Despite the continuing suffering, the spirit of Palestinian people remains strong and determined and the role of women at the forefront of peaceful protest is growing. Make sure that your congressional representatives know that you stand for peace with justice in Palestine. While 17-year-old Ahed Tamimi and her mother remain in prison, their village of Nabi Saleh remains under siege. For the last nine years, many of the village’s 600 inhabitants stage a weekly nonviolent protest following the Israeli confiscation of the main spring of the village for use by the Halamish settlement nearby. Israeli military forces respond to the peaceful demonstrators with teargas, arrests and sometimes bullets. Three people have been killed there and nineteen residents of Nabi Saleh are in prison. Nabi Saleh is not alone in experiencing the Israeli occupation’s persistent violence against Palestinian villages in the West Bank. Many others also know similar unprovoked violence of Israel’s military forces. Established in 2010, the Students for Justice in Palestine (SJP) has grown to more than 200 university chapters nationwide. Centering on freedom, justice and equality for the Palestinian people, SJP activists seek to educate and raise awareness among fellow students about the oppression experienced by Palestinians under the Israeli occupation, especially most recently in response to the killing of Palestinians in the Great Return March. But they also seek to pressure their respective universities to “divest its stocks, funds and endowment from companies that profit from the state of Israel’s violations of international law and Palestinian human rights through its ongoing system of settler colonialism, military occupation and apartheid,” as the Barnard College SJP chapter recently put it. Barnard became the latest student body to approve a referendum, pressuring its administration to divest, with 64% of students in favor. More than sixty university student bodies have approved similar referendums and specifically name offending companies like Hewlett Packard, Caterpillar, GS4, Lockheed, Boeing and Elbit Systems. SJP works further to get their university to also approve of the measure. Collaboration between the Trump and Netanyahu administrations has gone beyond embassy relocation and taken a deadly turn. The dangerous exchange programs bring together police, ICE, border patrol and the FBI from the United States with soldiers, police and border patrols from Israel for training in control, intimidation and the use of lethal force. In these mutual exchanges, the two countries learn from each other to promote discriminatory and repressive policies in both countries, including extrajudicial executions, shoot-to-kill policies, racial profiling, spying and surveillance, deportation and detention, and attacks on human rights defenders. A coalition of racial justice and Palestinian solidarity activists in Durham, North Carolina set out to oppose these deadly exchanges between the Durham police force and agents of the Israel Defense Forces (IDF). Opposition included an interfaith petition to end the exchanges, calling on the city council to cut any police partnership with Israel. The petition was signed by 72 clergy from Jewish, Christian and Muslim traditions. On April 17, 2018 the Durham City Council unanimously passed a resolution to oppose international military-style police training. Hopefully, the Durham City Council will not be pressured into rescinding this resolution like the New Orleans City Council did in repealing a divestment resolution it passed, also unanimously. Does your city have a dangerous exchange? Do you want to organize opposition? Contact MennoPIN for more information at mennopin@gmail.com. MennoPIN has endorsed a letter calling for Palestinian Christians and Muslims to help end the occupation. Signed by 14 groups supporting Palestinian human rights, the letter expresses “deep concern at the increasingly hostile direction of Israeli policies and actions, emboldened by the equally aggressive foreign policy stance of the Trump administration toward the Palestinian people.” To see the entire letter and endorsers, click here. Join Naim Ateek for a short course in Palestinian Liberation Theology, in person or by live streaming. Ateek is the co-founder of Palestinian Liberation Theology and has been inspiring readers with his ideas about faith, justice and the Holy Land for many years. For more information and to sign up, click here. Kairos Palestine, a Palestinian Christian movement advocating for the end to the Israeli occupation and a just solution to the conflict, has recently issued its Easter Alert for 2018. A guiding textbook for Easter to Pentecost, Kairos Easter Alert 2018 offers theological and political reflection including Donald Trump’s declaration on Jerusalem and its effects, the injustices toward Palestinian children and Easter hope. To read Kairos Easter Alert 2018, click here. During these difficult times for Palestinians and their allies who work to end the occupation, MennoPIN wishes you a joyous and hope-filled Easter. Since 1976 Palestinians have claimed Land Day at the end of March to voice their legal rights to reclaim land stolen from them in the 1948 Nakba (“the catastrophe”). This year Land Day is March 30 and the peaceful gathering will continue until May 14, Nakba Day. On March 30 thousands of Palestinians gathered nonviolently at the border of Gaza and Israel to protest. Heavily-armed Israeli forces responded by killing 5 Palestinians and wounding over 300 others. The fear is that hundreds more will be killed and thousands more wounded during the two weeks leading up to Nakba Day. Pray for peace as Palestinians nonviolently risk their lives in seeking justice. Ahed Tamimi, the teenage Palestinian girl who became an international symbol of Palestinian resistance, accepted a plea deal in which she will serve eight months in an Israeli military prison and pay a fine of 5,000 shekels (about 1,400 USD). During Ahed’s trial and sentencing, another Israeli court reduced the already short sentence of an Israeli soldier, who was filmed executing a prone Palestinian man in cold blood, to just nine months, only one month more than Ahed’s sentence. 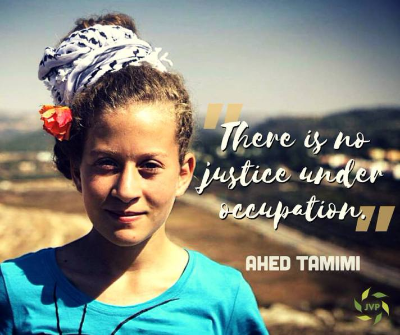 Ahed, who was credited with time-served, should be home in July 2018. One of the best ways to understand the people of Palestine and their struggle for justice is to go there yourself. With knowledgeable leadership and guidance, you can see both Holy Land sites and meet and talk with Palestinians and Israelis who oppose the occupation and are working for justice for the Palestinian people. MennoPIN recommends the following conference and five tours taking place in the upcoming months. Go to Palestine and expand your knowledge of the Palestine-Israeli conflict and hear from those working on the ground for justice and peace in the Holy Land. Christian Peacemaker Teams’ Nakba Day Delegation to Palestine. April 30-May 14. Deadline is April 8. Be part of this Christian Peacemaker Teams’ trip to Palestine to observe Nakba Day 2018, seventy years after Zionist forces drove out Palestinian inhabitants from their homes. CPT delegate members will gain perspective on how ongoing issues affect daily life and will experience the power of Palestinian and Israeli citizens overcoming major obstacles. Delegates will meet with Palestinian human rights representatives and peace workers and visit families whose homes and livelihoods are threatened by expanding Israeli settlements. For more information, click here. Christ at the Checkpoint. May 28-June 1, 2018. Held at Bethlehem Bible College in Bethlehem, Palestine and led by a diversity of speakers. Christ at the Checkpoint conference provides a platform for different opinions to be shared, and this year’s speakers will bring diverse perspectives on how to keep Jesus at the center of our lives as it pertains to every aspect of life. The conference seeks to form people by the love of God, teachings of the Bible and a fearless life of discipleship amidst the complexities of the Israeli-Palestinian conflict. To find out more about Christ at the Checkpoint conference, click here. “Come and See” Trip to Israel/Palestine. June 17-30, 2018. Leaders Kathy Bergen, Joy Lapp and Arnie Voigt. A deeply engaging alternative tour to the Holy Land. See the holy places – Jewish, Christian, and Muslim; Meet with Palestinian and Jewish activists and human rights groups; Learn about the impact of the Israeli occupation on Palestinian life and consider what is needed for a just peace. Beginning and ending in Jerusalem, the trip also includes time in Bethlehem, visiting a Bedouin village in the Negev, touring the site of a Palestinian village destroyed in 1948, traveling to Nazareth and the Sea of Galilee, meeting with the Christian Peacemaker Team in Hebron, visiting a refugee camp, and much more. For more information, click here or contact Joy Lapp: lappj@earthlink.net; 720-201-3697. “Come and See” Solidarity Tour of Palestine and Israel. September 2-15, 2018. Led by L. Michael Spath and Doug Thorpe. This tour will take you to Bethlehem (Nativity Church, Shepherds’ Fields and the Tent of Nations); Jerusalem (Holy Sepulchre, Mount of Olives, Garden of Gethsemane, Al Aqsa Mosque, Melkite Catholic Cathedral and more); Judean Desert (Jordan River, site of John’s baptisms, Qumran and the Dead Sea); Galilee (Capernaum, Tabgha, the Sea of Galilee, Magdala, Nazareth and the Mount of the Beatitudes); Ramallah (Muqata and Nelson Mandela Square) and Hebron (Old City and Tomb of the Patriarchs). For more information, contact lmichaelspath@gmail.com. Sabeel Fall Witness Visit. October 30 – November 7, 2018. Led by Naim Ateek, co-founder of Sabeel Ecumenical Liberation Theology Center, East Jerusalem, Palestine. Worship with Palestinian Christians. Meet and reflect with Palestinian Christians and Muslims as well as Jewish Israelis and internationals who partner with Sabeel in nonviolent resistance against the violation of international and humanitarian law. Experience the realities of the Palestinian community living under Israeli Occupation: the Wall, settlements, check points, confiscated land and demolished homes, refugee camps and environmental degradation. Learn about the loss of civil and property rights of Arab Israeli citizens. For more information and to register, go here. A Peacemaker’s Pilgrimage to the Holy Land. January 16-27, 2019. Led by Richard Blackburn, Executive Director of Lombard Mennonite Peace Center, the three-center pilgrimage will include Jerusalem (Mount of Olives, Mount Zion, the Old City, Yad Vashem, Sabeel Ecumenical Liberation Theology Center); Bethlehem (Church of the Nativity, Shepherd’s Fields, Christian Peacemaker Teams in Hebron, Diyar Consortium, Wi’am Palestinian Conflict Resolution Center) and Galilee (Nazareth, Cana, Church of the Beatitudes and a boat ride on the Sea of Galilee). The Pilgrimage will also include visits to various peacemaking ministries led by Palestinian Christians working for peace. Teaching sessions on the Israeli-Palestinian conflict, biblical peacemaking and conflict transformation are central parts of the tour as well. For more information on the tour and how to register, click here. MennoPIN encourages you to join Eugene Mennonite Church, Eugene, OR and Peace Mennonite Fellowship, Claremont, CA and become HP-Free. Reach out to your pastor, church council and congregation to sign the HP-Free Church pledge, committing to not purchase Hewlett Packard computers, printers, inks, and other products until HP stops profiting from occupation and human rights violations. For more on the HP-Free Church Campaign go here. MennoPIN and Mennonite Church USA encourage Mennonite students to participate in Palestine Advocacy Day & Training 2018 in Washington, DC, March 16-19, 2018. If you go, we will cover your registration fee (including hotel for three nights, breakfast and lunch on Saturday and Sunday and breakfast on Monday), and we will also reimburse you up to $100 for travel. As young leaders and activists, you will learn the skills needed to lead campaigns in your communities, engage elected officials and advocate for the rights of Palestinians. The intensive training in political engagement and community mobilization will include a day of lobbying on Capitol Hill. For more information about the advocacy days and to register, click here. When you register, you will not need to send any money if you use this code: jonathanscode. Then, upon your return, send your travel reimbursement request (up to $100) to mennopin@gmail.com. We hope you will go and experience the power of organizing for justice and peace! On January 30, 2018, in a case testing First Amendment free-speech rights, Kansas Mennonite Esther Koontz and the American Civil Liberties Union won an early court decision in its law suit against Koontz who lost a contract with the State of Kansas because she would not sign a statement pledging not to participate in any Boycott Divestment Sanctions (BDS) actions. U.S. District Court Judge Daniel Crabtree wrote the following in his decision: “This ruling should serve as a warning to government officials around the country that the First Amendment prohibits the government from suppressing participation in political boycotts.” Koontz’ refusal to sign was informed in part by the MC USA Orlando decision last summer to boycott consumer products that profit from the Israeli occupation of Palestine. Seventeen-year-old Palestinian protestor, Ahed Tamimi, one of hundreds of Palestinian children imprisoned by Israel, began her trial at Ofer military prison near Jerusalem on January 15, 2018. She asked that the hearing be open to the public and the press, but the military judge refused and began the trial behind closed doors. The judge insisted that he was acting in the best interest of Ahed, but her attorney, Gaby Lasky, protested vehemently, saying the family wants an open trial: “The court decided what is best for the court, and not what is good for Ahed…We believe that this is an indictment solely created to deter Ahed and other Palestinian youth.” Ahed’s family was able to remain in the courtroom and her father, Bassem, was heard shouting out to Ahed: “Stay strong, stay strong.” Ahed is imprisoned because she slapped an Israeli soldier in the face on December 15, 2017, after another soldier shot her 15-year-old cousin, Mohammed, in the face with a rubber-coated steel pellet. 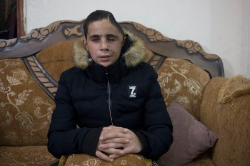 Mohammed required surgery to remove part of his skull. Ahed’s trial will resume on March 11, 2018. She is being held in prison for the duration of the trial. The Boycott, Divest, Sanctions (BDS) movement was nominated on January 31, 2018, for the Nobel Peace Prize by a Norwegian Member of Parliament. In his formal announcement, Bjørnar Moxnes stated: “Awarding this year’s Nobel Peace Prize to the BDS movement would be a powerful signal, emphasizing the international community’s commitment to support a just peace for the Palestinian people… the Israeli people and all people in the Middle East – and the world at large.” To sign the Friends of Sabeel North America (FOSNA) BDS Nobel Peace Prize support letter, click here. In July 2017 at the Orlando MC USA convention, delegates adopted the “Seeking Peace in Israel and Palestine” resolution, which included a commitment to “avoiding economic support for occupation.” On November 20, 2017, representatives from MC USA agencies and related organizations met for a consultation on investments in Israel/Palestine. You can read the report of that first consultation here. Rise and Kill First: The Secret History of Israel’s Targeted Assassinations (by Ronen Bergman, Random House, January 30, 2018) – Bergman is a journalist based in Israel who probed the targeted killings of thousands of Palestinians by Israel Defense Forces. Gaza: An Inquest into its Martyrdom (by Norman Finkelstein, University of California Press, January 9, 2018) – Finkelstein chronicles the humanitarian disaster in Gaza, including the eight devastating ‘operations” by Israel against Gaza’s largely defenseless population in which thousands have died and tens of thousands left homeless. 50 Years of Occupation: Dispossession, Deprivation and De-Development(Association of International Development Agencies (AIDA), February 12, 2018) – AIDA, a coalition of 70 international NGO’s, including Mennonite Central Committee, combined to document the decades-long strangulation of Palestinian economic prospects and human rights. A new book by Ronen Bergman, the intelligence correspondent for the Israeli Yediot Aharonot newspaper, chronicles Israel’s ‘2,700’ assassination operations. In his book,Mr. Bergman raises moral and legal concerns provoked by state-sponsored killings. Ahed Tamimi at a non-violent protest march with other Palestinian women. Some even call her the Palestinian Joan of Arc, the 16-year-old who slapped Israeli Defense Force (IDF) soldiers outside of her home in the village of Nabi Saleh after her 15-year-old cousin was shot in the face with a bullet. At 4 am the following morning, IDF soldiers broke into her home and arrested her along with her mother, father and cousin Nour. Later, an Israeli military judge ruled that Ahed, who had not been charged with a crime, must remain in custody during her trial. You can view short videos of Ahed in detention here and a five-minute video of an earlier interview with her here. MennoPIN encourages you to join Friends of Sabeel North America (FOSNA) and Mennonite Central Committee (MCC) in taking action to support Ahed and all Palestinian children by supporting H.R. 4391, a bill introduced in the House of Representatives by Rep. Betty McCollum (D-Minn). See the web pages of FOSNA and MCC for further details on action you can take. In addition to moving the US Embassy to Jerusalem, President Donald Trump has further crushed hopes for peace between Palestine and Israel by eliminating the US voluntary contribution to the United Nations Relief and Works Agency (UNRWA). Created in 1949 to carry out direct relief for Palestinian refugees, UNRWA called for Palestinian refugees to return to their home after the being forced out by Israeli Zionist forces in the 1948 Nakba (catastrophe). Alternatively, refugees unable to return would be fairly compensated for their land. From the beginning of UNRWA, Israel has refused to allow refugees to return or give fair compensation. The US has supported Israel’s refusal to cooperate with UNRWA by vetoing every United Nations resolution for compliance. You can voice your opposition to the elimination of UNRWA funding and support of Palestinian human rights by calling the White House comment line at 202-456-1111. Inspired by the South African anti-apartheid movement, in 2005 over 170 Palestinian unions, political parties, women’s organizations, professional associations and other civil society bodies called for boycotts, divestment and sanctions (BDS) as a form of nonviolent pressure on Israel to honor the humanity, dignity and human rights of Palestinian people. They invited support from allies around the world. Since then, BDS has become a global movement of opposition to the Israeli occupation of Palestinian land and oppression of its people. In recent years the BDS movement has blossomed throughout the United States. As a result, pro-Israeli and Zionist forces have begun to push back with anti-BDS legislation on both the state and national level. In one attempt to stand with oppressed Palestinians and challenge the threat of our constitutionally protected right to freedom of speech, nearly 500 Christian leaders from across the nation have signed a petition opposing anti-BDS legislation. Add your support here. The United Methodist Church chose the Nassar family to receive one of its 2017 Peace Awards. The Tent of Nations lies on the Nassar’s 100-acre farm located southwest of Bethlehem in a highly disputed area of Palestine controlled by the Israeli Government. The family remains on their land and share their story of peace with guests from around the world. The family is not permitted to develop their farm for agricultural purposes, not allowed access to power, water, or sewer infrastructure, nor obtain permits for any new buildings. The family has instead come up with creative and sustainable alternatives. Each summer, children from local villages (Christian and Muslim) participate in a summer camp aimed at giving the children freedom and distraction from the surrounding politics, empowering the children with self-confidence so that they can be a part of a better future for Palestine. The family also established the Bent Al-Reef Women’s Centre to empower women with classes in English, computer, art, etc., and encourage them to play a role in shaping society. Find out more about the Tent of Nations. Reach out to your pastor, church council and congregation to encourage your church to sign the HP Free Church pledge, committing to not buy HP computers, printers, inks, and other products until HP stops profiting from the illegal Israeli occupation of Palestine and human rights violations. For more information on how your church can become a HP-Free Church go here. Street artist Bansky has created new Christmas artwork on The Walled Off Hotel in Bethlehem, Palestine. 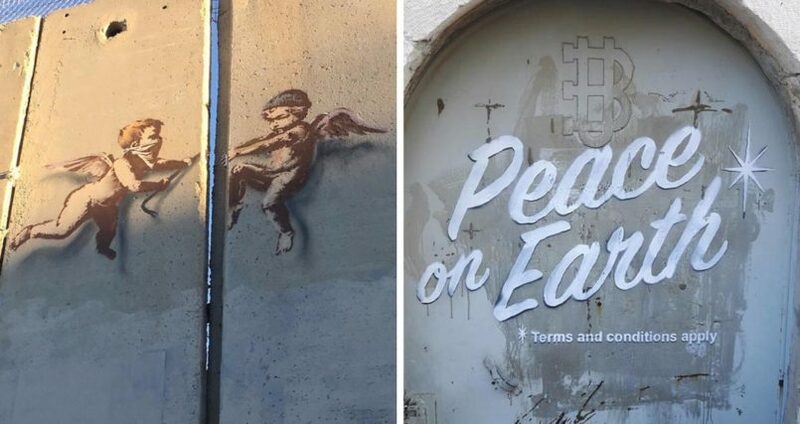 The familiar message now has a caveat: “Terms and Conditions Apply.” Meanwhile, two angels attempt to pry open the wall with bare hands and a crowbar. From all of us at MennoPIN, Christmas blessings as we together seek unconditional Peace on Earth, tearing down the walls of hostility that divide the Holy Land today, seeking peace and justice for Palestine and Israel. Hewlett-Packard has spun off part of their company, effectively splitting the corporate giant in two. HP has been one of the main targets of the BDS movement because of its complicity in the security apparatus and infrastructure of Israel and its illegal occupation of Palestine. It is unclear which of the two companies is involved with the occupation. Until it is clear, the BDS movement continues to recommend the boycott of HP. BDS appears to be increasing its focus on the tourism sector, especially TripAdvisor and AirBnB. More on that in future updates.Update on the Esther Koontz lawsuit (ACLU vs. State of Kansas). Jonathan Brenneman, MC USA Coordinator, Israel/Palestine Partners in Peacemaking and Rachelle Lyndaker Schlabach, Director of the MCC US Washington Office are working on a strategy to form a Mennonite delegation to Capitol Hill that would focus on support of HR 4391, Promoting Human Rights by Ending Israel Military Detention of Palestinian Children Act. The bill would require the Secretary of State to certify that American funds do not support Israel’s military detention, interrogation, abuse or ill-treatment of Palestinian children. Jonathan Brenneman and Rachelle Lyndaker Schlabach were interviewed in The Mennonite magazine online, TMail, to explain the likely devastating impact of the Trump administration’s decision to move the US Embassy from Tel Aviv to Jerusalem. Please read the informative interview here. The U.S. vetoed a UN resolution seeking to reaffirm Jerusalem’s status as unresolved, after 14 UN Security Council members voted in favor of the resolution Monday, in response to U.S. President Donald Trump’s decision to recognize it as Israel’s capital. MennoPIN operates on a shoestring budget. We have no paid staff and the Steering Committee are all volunteers. We rarely ask for financial support, but today we ask you, our members, for some help. There are two ways that MennoPIN incurs financial obligations. MC USA generously allows Jonathan Brenneman, their Coordinator, Israel/Palestine Partners in Peace, to give invaluable assistance to the ministry of MennoPIN and we, in return, provide modest financial support to MC USA. There are also times in which MennoPIN Steering Committee members are invited to an important consultation or to engage in networking, incurring some financial expense. Thank you for any gift you can make to support the work of MennoPIN. You can make your check out to Pleasant View Mennonite Church with MennoPIN on the memo line. The address is Joy Lapp, c/o MennoPIN, 504 W Henry Street, Mount Pleasant, IA 52641. Your gift is tax-deductible. Thank you very much! On November 20, the Everence community offered a valuable meeting opportunity for representatives of Mennonite-related organizations and agencies working and serving in Israel/Palestine. The gathering was the first of ongoing consultations mandated as part of the MC USA “Seeking Peace” resolution, Orlando 2017. Everence representatives discussed Everence’s mission, structure and funds, provided information regarding the evolution of military and human rights screens and the use of occupied assessment service. In addition to MennoPIN, agencies/organizations participating included: MC USA, Mennonite Mission Network, Mennonite Central Committee, Mennonite Education Agency, Christian Peacemaker Teams and the Peace and Justice Support Network. Mark Regier, Vice President of Stewardship Investment at Everence summarized the shared sense of those gathered: “The issue of positive economic development/investment in Palestine is both vitally important and incredibly complex.” Future consultations are planned. For the first time ever in the U.S., legislation has been introduced to defend the rights of Palestinian children. The bill, introduced by Rep. Betty McCollum (D-MN), would require the Secretary of State to ensure that no U.S. funds going to Israel are used to violate the human rights of children. Please ask you congressperson to support the bill, Promoting Human Rights by Ending Military Detention of Palestinian Children Act. Ervin Stutzman, Executive Director, Mennonite Church USA, joined sixteen other Christian leaders opposing the Israel Anti-Boycott Act in a strongly worded letter. MennoPIN and MCC both support the defeat of this bill. Ask your members of Congress to oppose the Israel Anti-Boycott Act. Oppose the Nomination of Kenneth Marcus for Assistant Secretary of Civil Rights in the Department of Education. Marcus has a long record of filing spurious discrimination claims with the Department of Education to suppress Palestine activism on campus. He also supports anti-BDS legislation. See the US Campaign for Palestinian Rights for further information on how you can oppose Marcus’ nomination. Please Continue to Support Esther Koontz. School teacher and Mennonite Esther Koontz has been denied employment by the State of Kansas because she refused to sign an oath that she would not engage “in a boycott of Israel [or territories controlled by Israel].” She is filing a law suit (with the help of the American Civil Liberties Union) against the State of Kansas for infringing upon her First Amendment rights. You can offer your words of support and encouragement to Esther by sending an email to SupportEsther@MennoniteUSA.org. MCC Washington Memo for more information about opposing the Israel Anti-Boycott Act. Members of Congress have introduced a bill to prevent U.S. tax dollars from paying for human rights violations against Palestinian children during the course of military detention. Israel is the only country in the world that systematically prosecutes an estimated 500 to 700 children each year in military courts that lack fundamental fair trial rights and protections. MennoPIN encourages all MC USA congregations to become HP-Free churches. Hewlett Packard is one of the largest contractors for the U.S. defense industry and provides registration and surveillance technologies for various types of repression of Palestinians by the Israeli occupation. This short video will give you a better picture of all the ways Hewlett Packard knowingly and profitably participates in the oppression and military occupation of Palestine by Israel. Friends of Sabeel North America (FOSNA) offers further information about the activities of Hewlett Packard and ways to mobilize your church to become HP-Free here. You can sign up as a church or as an individual. Make Your Church (and Yourself) HP-Free Today! “Esther asserts that this infringes on her First Amendment rights. This case may have broad implications, as 22 states have similar laws. Esther Koontz is the latest in a long line of Mennonite peace witnesses. May we support her, as she bears the cost for such a witness. MennoPIN invites members across MC USA to join in support for Esther by sending her letters of encouragement. We encourage you to offer you words encouragement to Esther at SupportEsther@MennoniteUSA.org.